I’m certain someone will ask which tarp I’m using in the video 🙂 It’s the Hilleberg XP10. Nice video! I’ll take your story one step further, not only are tarps fine in the rain but, I’ve slept many nights in the rain forest in Panama (US Marines) with nothing but my poncho setup ‘A’ frame style and everything was dry all night and in the morning. Last year I spent a night in the SE US under a tarp with a RAGING thunderstorm all night long. 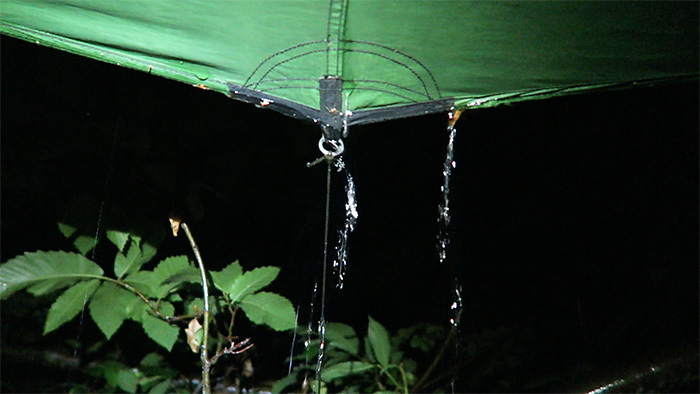 I stayed dry while my son’s expensive ultralight tent filled with water. I could not agree with you more Paul. A good tarp will keep you very dry if set up properly. I believe people who have gotten soaked either failed in their setup or had a ventilated tarp. There is nothing more relaxing than the sound of rain falling on what is overhead, tent tarp or otherwise. I’ve never had any sort of problem using a tarp and the 2 I generally use are cheap as chips. I love sitting under a tarp listening to and watching the rain. I couldn’t agree with you more Paul! I spent weeks at a time in the field under a US Army poncho set up as shelter, so the Aussie hoochie I have now is pure luxury. 7 years in the Army and I got wet once and that was from ground water flow and bad camp choice. I have tents, they have their uses but nothing like tarp and bivvy camping. Love your videos and keep up educating us all! Hi Paul, no complaints here for tarps I’ve done plenty of nights under tarp in the rain and so have my Scouts non of us have got wet. We love it. I always use a tarp or poncho. Only time I’ve had problems they were my fault. I like them so much I no longer own a tent. Totally agree Paul, I am a British military survival instructor and my tarp is my home! be it here in the uk or overseas home is where the tarp is. Ps, I really enjoy your articles as you have a passion for the outdoors and with this passion comes credibility. I have used a poncho as a tarp in all terrain (jungle, mountains, etc.). I have gotten wet when it was my fault (didn’t cinch the hood tightly once), but overall I find the tarp easier to use than a tent. I remember a heavy thunderstorm when we were car camping with the kids when they were young. All about me were collapsed and leaking tents. I slept bone dry under my poncho “hooch” amidst it all. Drainage is an issue, just as it is for a tent. In Panama, we used ponchoes with bug nets and hammocks to best keep the creepy-crawlies out. I think you hit the nail on the head here by pointing out that when you get wet under a shelter such as a tarp or a ponch, it’s the fault of the person who erects it. But as you say, it is infrequent and, by implication, this comes from experience. LOL, awesome video Paul. Would be really nice to see the setup of that from the outside. It looks like you had a real slope on it, with a few inches off the ground at one side, and a few feet at the other. But that could be the camera distorting the perspective! It was set at a similar angle to the photo linked below but higher off the ground. Last few years in Australia I’ve been using tarps more than tents. For one thing you don’t get instantly roasted as soon as the sun comes up. Tarps do work IF they don’t have holes and rips! Last week I took the hoochie into the west Scottish highlands. I kept dry the first couple of nights, but 3rd day of rain was too much for it. A repaired rip had been re-opened, and the other side had a slow drip and was wet underneath. Closer inspection revealed dozens of tiny holes, from needle through to 0.5 centimeter diameter in size. I suspect mum appropriated it as a ground cloth for house renovations and it got trampled on coarse concrete. To be fair, on the 3rd day of hiking my goretex jacket also gave up on me. Might be time to retire some of my older gear. We are the friends of group love to travel and also camping lover. Always carry tarps for temporary shelter. It is very useful to keep you dry in the rain. I can’t count the number of trips that my tarp has saved. I have never gotten wet under my tarp.